Udaipur. 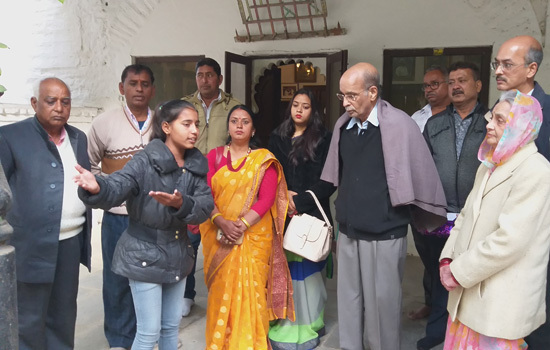 Mewar's daughter Neha Vaishnav, along with her teachers, met a member of the former Mewar Rajparivar, Mahendra Singh Mewar, Nirupama Kumari, and Vishvaraj Singh, after singing a poem written on pannadhay on social media. Listening to the melodious voice the members of the former royal family also applauded Neha.
. Neha was invited by the Raj-family's Mahendra Singh on a special invitation to the residence, where Neha once again performed the song showing the sacrifice of his same style. Listening to this song of Neha, all the members of the Raj family were gadding. They wished Neha's bright future.